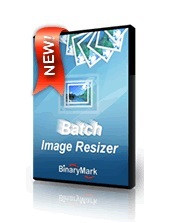 Batch Image Resizer Standard FREE for 72 hours. With Batch Image Resizer, you can resize, rotate, add a transparent border, and save pictures with an icon preview. Best of all, it uses batch mode processing – so you can manipulate multiple pictures at once. You can save the pictures in several different formats as well. You can fit the images to a box, resize by the longest side, save in PNG, JPEG, GIF, TIFF, and BMP format. You can even extract the first page of a PDF document, convert it to an image, and resize it.